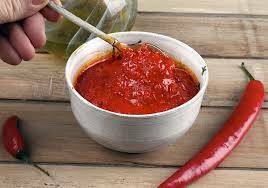 Red chilli paste can be prepared without any difficult at home.This paste will be very useful in your cooking to enhance the taste,Aroma and colour. Nowadays we are not comfortable to do stone grinding,more over we do not find time for all these to prepare in our fast moving every day life. This on hand method can be followed to bring near by value of our ancestral practice and taste in our preparation.Methods and uses are given below for your convenience. This paste can be used for Vengaya kosu,Kichadi, Varuval,Cauliflower chilli fry and in all vegetable masalas. This can be used in all marination for wonderful colour and taste. Soak red chilli for 1 hour. Close and cook for 15 minutes in low flame along with the soaked water. Bring it to room temperature grind this to a smooth paste,by adding the above mentioned oil. Store it in a clean container,keep it in refrigerator. Cut lengthwise and remove seeds,(if you do not like too much hot)soak in hot water blend it and use it. Do not throw seeds this can be used because chilli seeds are the hottest part in chilli. Chilli seeds can be used for seasoning. Red chilli boiled in water adding a little vinegar; remove and blended to a fine paste. This red paste can be used in making a variety of dishes.